Freelance audio work including mixing, mastering, tracking, editing. Between 2005 and 2015, I played over 1,000 shows, both solo and as an auxiliary musician for other touring acts. I performed on over 30 albums and have composed for radio, television, and internet video series. I've been featured in The New York Times, on the CBS Evening News, and on NPR. Certificate of completion for "Music Practice through Games". Learning teaching and practicing skills utilizing games. This course aims to equip beginners in music with the skill to read music and to understand music better. You will be introduced to the various elements on the music score, and we will guide you to learn all the basic theory topics, step by step. You do not have to know anything to take this course, except an interest in music theory! Teaching Music : Start teaching an instrument successfully. Thank you Chris! Jordan says see you at the next lesson!!! Just awesome. Very patient, fun, knowledgable, and an exceptional communicator and teacher. Excellent! Can’t wait for my next lesson. Chris was informative, humorous and easy going. So glad I chose Chris as my online music teacher! He's a lot of fun. Chris is an excellent teacher - focused both on the big map of where I'd like to travel and also where we are at the moment. He's thoughtful and tuned in to every detail of my playing and form. He's also very positive and an awful lot of fun! Chris is a great instructor and my daughter looks forward to her cello lesson with Chris! Christopher is an excellent teacher! Very knowledgeable, insightful, helpful and enthusiastic about teaching and learning. Chris's style of teaching and breadth of musical styles and genre was a breath of fresh air. After 4 years of strictly classical Suzuki method, it was time to try something new to keep my 12 year old daughter interested. She and Chris are currently transposing a Queen song so my daughter can play it on cello. Chris's teaching style is laid back and the lessons are largely directed by the student's interests, which is just what was needed in our case. This instructor was uninterested in what I wanted. He would often say whatever you want and then not do it. When I first brought it to his attention that I was unhappy with the lesson is when I should have canceled them. 8 lessons 4 months and only halfway through Suzuki book one is unacceptable. Just a waste of time and money. Christopher is a fantastic teacher! He makes everything fun and is great with my son who is just beginning guitar. Highly recommended! This lesson was great. Chris is an excellent teacher, and is giving me just enough of a challenge to keep me interested. I feel I will learn to play the ukulele very well with Chris as my teacher. I look forward to my next lesson. Today was my first lesson with Chris. Things went very well. I'm not new to music, but I'm a complete beginner on the ukulele. Chris is taking that knowledge and putting together a lesson approach that will teach me how to play the ukulele well, and help me to achieve my goals. I look forward to many more productive lessons with Chris as I sense he is a great teacher. Christopher is a patient, enthusiastic, eloquent teacher. I always look forward to my weekly lesson. Chris is very friendly teacher. My son enjoys the lesson w/him. We are really happy we found Chris. He is great! Always in a good mood and ready on time. My son is autistic and really needed the right fit for a teacher and we found it. Only one lesson so far, but I think Chris is going to be a huge asset for my cello skills. Extremely friendly and easy to talk with. Explains techniques and concepts in an easy to understand fashion. Chris is a great guy and insightful teacher. Lesson was great. I've had a great experience! Today was my first lesson and I left feeling all the more educated and on the road to improvement, as I had hoped. Chris was very friendly, knowledgeable, communicated well, and I felt at ease. I also love his flexibility. All around what i am needing in a teacher. Christopher is a wonderful instructor. He is enthusiastic about teaching, patient, and excited to help is students reach their goals. He is clear and concise, which I appreciated given we only had 30 mins. He included not only how to play, but how to structure practice! Really helpful! I'm already starting to solo and it's only been 3 weeks! I'm very grateful to have found a teacher as generous as Chris. Since reviewing is so important in our culture anymore, I always like to get a good sampling before constructing a review. Chris shows consistently that he listens to his students, offers positive critique, and molds his approach to meet the student where they are. Chris makes it easy, fun and relaxing to learn. It isn't hard to gather that Chris is a professional and experienced teacher. I am a very beginner, adult student, and I can appreciate how Chris can teach a spectrum of students at different skill and experience levels. Thanks to Chris for making my hobby to learn an instrument such a dream! Man of Great Patience, helps those who flounders. Questions o' many, he'll answer in plenty. We adore him more with every lesson. He is patient and flexible! So far so good. After my first lesson I feel like I have learned so much. Chris was fun and informative. He took into account what I wanted and needed to learn and gave me plenty of stuff to work on. I was a little unsure about the online format but with a little tweaking on my end it was fine. Looking forward to my next lesson! My daughter is an absolute beginner and was very nervous, but Chris was patient and personable. We learned so much in an hour! She can't wait for her next lesson. He was so patient with my absolute beginner! Chris has a warm and easy-going personality that makes learning comfortable and easy. He is very patient and kind. Hea the definition of what a good teacher should be. Super professional, helpful, and flexible to what I know and would like to focus on. Chris is great! After my first lesson with Chris, I knew I had found the right teacher for me. He's extremely patient and thorough--and has a great sense of humor which made it more relaxed. I wasn't sure how taking virtual lessons would go, but I enjoy the convenience of in-home learning! he is a really good teacher. i myself am having trouble switching ears from classical to blues. Chris was warm and friendly. I was very at ease with him. He had a great sense of humor which put me at ease and made learning easier. Really enjoying the online lessons with Chris. I am learning so much! super cool and funny. he has a really good understanding of music theory. Chris is easy to talk to and does a great job explaining techniques and practical approaches to playing. Looking forward to many more lessons. Super helpful as always. Great technique advice. Christopher is patient, good listener, and enthusiastic, all the important element of a good teacher. He was very patient with me! Thank you!! Christopher is very knowledgeable and has a great personality which makes learning a lot easier. Chris has been an amazing cello instructor! 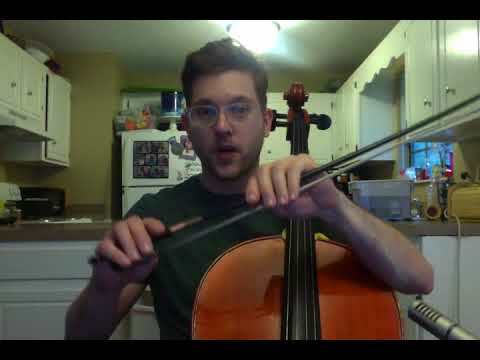 He does a great job explaining how your body should feel when you're bowing (great for a first time string student) and hand positions. He really helps you integrate cello practice into whatever time you have for it and you can tell he really has a passion for the instrument and knows it well. On top of it all, he's just a really nice, fun person and the lessons fly by!